It has been a good long time since I saw a movie as massively, unintentionally cheesy as In the Name of the King. Lured into purchasing it on Blu-Ray as part of a batch offer, I already had my doubts about a film being marketed just on the basis of the lead having been in The Expendables. But seeing Jason Statham’s hunky face on the cover made me walk into the trap regardless: I’m just superficial that way. After the purchase, I took better look at the director and saw the name Uwe Boll, in very tiny print. It was then that I knew for sure I’d been had. Uwe Boll is known for his ability to make bad movie adaptations of game franchises, such as Bloodrayne, Alone in the Dark and Far Cry. They are said to be generic and uninteresting at best, hilariously bad at worst. He once famously challenged his unflagging critics to take him on in the ring and settle their score man-to-man, apparently believing he could prove the quality of his work by punching a critic in the face. To be fair, based on his reputation I had always avoided his movies like the plague and had never given him a fair shake. But going by this movie, I should just have taken other people’s word for it and spared myself two hours of low-budget mediocrity. The whole project is po-faced, misjudged and wobbly in all aspects from acting and script to special effects. Even the passionless soundtrack conspires to makes things drag. 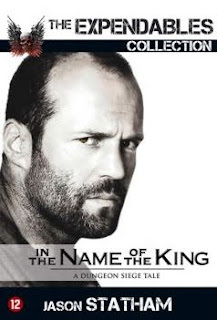 In the Name of the King – a Dungeon Siege Tale is based on a Role-Playing game I know nothing about and stars Jason Statham as Farmer, whose day-job is evident from his name. He has a son and a wife, but not for long, as soon they are both taken from him by the ‘Krug’, who look suspiciously like Trolls and were probably renamed to sound less generic. The Krug have a silly semi-gorilla walk with corresponding sounds, unconvincing bodysuits and never let you forget that there must be an actor inside, feeling very bad for himself. There is a magical mastermind pulling the Krug’s strings (the ever-evil Ray Liotta) and his plan is to take over the land by getting rid of the king (a strangely tightfaced and overly made up Burt Reynolds), with help from the king’s weakling nephew (Matthew Lillard, better known as Shaggy from the Scooby Doo movies). Not to spoil anything, but Farmer stops him. The end. I have left out some other characters like a magus/magician (the elsewhere admirable John Rhys-Davies) and Farmer’s daddy substitute (the elsewhere fantastic Ron Perlman), but then none of them is especially memorable and they remain firmly 2D, if not 1D. One or two of the minor characters even risk travelling into negative space. It is the script’s fault that people don’t really say the things that would make the most sense in any given circumstance and that what does come out of their mouth sounds stilted, but since Boll is the producer and director, blame still lands on his plate. Watching the movie, I kept being tempted to reach into my television, yank out the script and do a quick rewrite. I also wanted to rewrite the beginning and get rid of a ‘twist’ that was probably intended as gritty and shocking, but really is just severely emotionally misjudged. It sets the wrong tone and shows that the makers are in denial about making a goofy fantasy action movie. Even though In the Name of the King is very long and feels like it, somehow it doesn’t get around to putting in all the information you need to comprehend what is going on. For instance: there is a baffling group of semi-ninja warriors that just appear in the middle of a battle – on two occasions – without set-up or explanation afterwards. 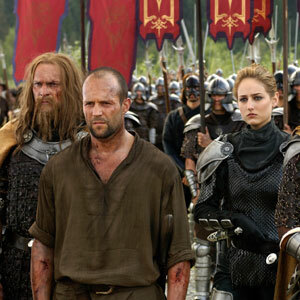 If only Boll had tightened up the story, got rid of some unnecessary characters and scenes, cut out about 30-45 minutes and used the extra budget to invest in a dialogue polish and better special effects… This might have enabled them to make the fight scenes look like more than just a live roleplaying session in the woods. On the other hand, this would probably have meant we would have had to do without the awesomely silly tree-people who swing around on vines and are able to use them to attack people by way of unconvincing computer graphics. It’s a mystery how Uwe Boll keeps getting the chance to make more movies. There always seem to be people willing to invest some money in his projects – as a tax write-off, perhaps - and some actors willing to spend time hamming it up and chewing the low-budget scenery. I don’t understand why all of the at least somewhat known actors I mentioned didn’t take one look at the script and at Boll’s reputation and ran in the opposite direction. The sounds of agents getting fired must have been everywhere during and after the filming. Beefcake Statham fulfills the stoic hero part as best as he can, given the circumstances, but is a lot more fun in movies where he has a sense of humor than in flicks like this and The Transporter, where he is typecast as a frowning, one-note action man. To end on a positive note… uhmm… well, I guess some of the computer-generated vistas are actually quite nice and the Blu-Ray picture quality is crisp and clean. That’s pretty much all I can come up with. Despite this movie being a massive commercial flop, a sequel starring Dolph Lundgren is in the works, once again directed by Uwe Boll. God(s) help us all.